ROTARY HAMMER HILTI TE 50 SDS MAX Rentals Ft. Collins CO, Where to Rent ROTARY HAMMER HILTI TE 50 SDS MAX in Ft. Collins, Wellington, Greeley, LaPorte, Loveland, Windsor CO and all of Northern Colorado. 1 drill bit is included 1/2, 5/8, 3/4, 1"
Larger bits 1 1/4" AND 1 1/2" are available for rent. 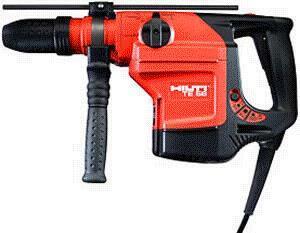 14.2 AMPS, use 12 gauge cord, 100 ft max length. Weight 14.5lbs, 18.7" long without the bit. * Please call us for any questions on our rotary hammer hilti te 50 sds max rentals in Fort Collins, Wellington, Greeley, LaPorte, Loveland, Windsor CO and all of Northern Colorado.